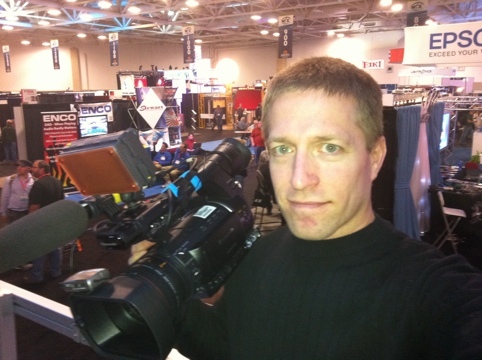 Two days on the show floor conducting interviews & product shots for a video that will be on EventDV Live. Lots of big vendors and cutting edge technology around every corner. I interviewed Teradek, Blackmagic Design, Haivision, Stream Monkey, Panasonic, ZiXi, Rushworks, and more. I was able to speak to Teradek about Cube and Bond, very exciting products that fit in the palm of your hand. Multi-homing broadband HD video streaming. That means when one network falters, the others carry the load. And did I mention that it fits in your hand? It does. Blackmagic Design’s ATEN shatters the price floor for HD video mixers. No longer is professional video mixing a +$10,000 hurdle. How about starting under $1,000. Yes. Professional HUI, yes. Works on a laptop, yes. HDMI / HD-SDI, yes. So many yeses. Stream Monkey is the nimble young primate able to jump and adapt to the market quickly, and provide a solid streaming service. Haivision‘s streaming services are deeper and not only deliver, but help companies manage multiple streams, media libraries, live streams and more. This is a deep portfolio of streaming & media management services, hardware & solutions. Rushworks deliveres volunteer-simple production hardware that enables a single professional to oversee many people who are willing, but lack the depth of experience & skills to run what would be a typical broadcast show. Once it’s set up in the Rushworks system, its as simple as pointing to what you want and it can be handed off after a minimal amount of training. ZiXi specializes in the highest quality streaming deliverable possible while offering the lowest latency. Panasonic takes their 400 and 450 video mixers and doesn’t just add on, they re-imagined them. The 410 isn’t just more inputs, more capability, more versatile media handling, it’s also internal still & video playback. Even more amazing is an open API that allows 3rd-party developers to load software into the mixer to control it with something else, or enable the mixer to control other hardware, like decks, lighting systems, stage, whatever you can imagine.